Purchase specially marked Canada Dry and A&W products that feature PINS so you can enter a contest and gain access to $4 worth of coupons! 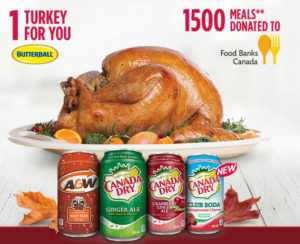 There is one $50 Butterball turkey coupon available to be won each day during the contest period. You have until December 3, 2018 to enter your PIN. Coupons are available while supplies last and expire December 31, 2018. Win 1 of 3 BOSCH Dishwashers!